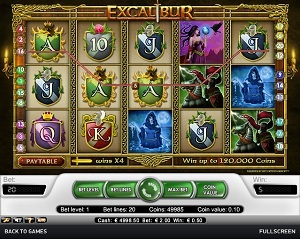 Excalibur is an action adventure-filled online video slot machine game from Net Entertainment that has been released on May 2008. This video slot machine game has 5 reels and 20 pay lines. The theme of Excalibur is inspired by the legend of King Arthur, a British leader of the late 5th and early 6th centuries, who led the defense of Britain against Saxon invaders. King Arthur’s weapons are named Clarent and Excalibur (from which this online slots game was named after). In the Excalibur online slots game, players are whisked to the magical realm of medieval fantasy where you will find knights, beautiful maidens and the legendary sword Excalibur, which is usually attributed with magical powers (or it is normally related to the rightful sovereignty of Great Britain). Online video slots games are very interesting to play on especially when you have already experienced to try out its free play mode, and that is what’s great about Net Entertainment as they let interested players to play instantly on any of their online slot games, without requiring them to download anything at all! If you have watched TV shows, movies or you have even read novels or books about King Arthur and you were fascinated by them, for sure you will love playing a while in Excalibur video slots game as it features two types of Wild Multiplier symbols that doubles or quadruples your payout every time you get winning combinations, scatter wins, a bonus feature game that rewards you with free spins wherein all your wins are tripled, a maximum cash jackpot of $40,000, a maximum coin jackpot of 40,000, and last but not least, it has an awesome 95.1% payout ratio! Net Entertainment always strives to make top-notch graphics and sounds, to make all their slot players thoroughly engaged and entertained at the same when playing any of their online slots games. There isn’t much to see in the background setting of the Excalibur reels, as you can only see two lit candles on both borders of the reels. The symbols are drawn in a very detailed manner and even if the colors are bright, it will not hurt your eyes. When you trigger Wild or Scatter symbol wins, you will get to see animations which make this game all the more interesting to look at. The overall graphic design of Excalibur showcases colors such as red, gold, black, pink, purple, orange, green and blue. As for the background music, the usual sounds are what you usually hear on a busy marketplace or at the outside of a castle during medieval times – horses whinnying, the chatter of townsfolk, and the music of a flute being played. Whenever you hit a winning combination, trumpet-like music fills your ears as the game celebrates your wins! The regular symbols are the card deck symbols which are 10, J, Q, K and Ace; and the other symbols are the vibrantly-colored characters based from the legend of King Arthur, which are: King Arthur, Merlin, Guinevere and Sir Lancelot, Lady of the Lake, Morgana, and Mordred (astride a horse). The Wild Symbol is the Excalibur sword. The Excalibur acts as a substitute for all other symbols, with the exception of the scatter symbol. The Excalibur Wild symbol doubles (multiplier x2) the payout of any winning combination, as long as it acts as a substitute symbol. The Gold Excalibur sword Wild symbol is a wild, multiplier symbol which quadruples (multiplier x4) the payout of any winning combination, as long as it acts as a substitute symbol. The Gold Excalibur sword Wild symbol only appears on the 3rd reel. The Scatter Symbol is the Gold Chalice. The Scatter symbol (Gold Chalice) does not need to come out in a line on an enabled pay line for you to win. The Scatter symbol (which can be scattered anywhere on the 5 reels) can give you winnings, as long as you hit 2 or more Gold Chalice scatter symbols in a single spin. If you hit 3 or more of this scatter symbol, you will activate the Free Spin Bonus Feature game where you can win up to 10 free spins + 3x multiplier on all your winnings during the Free Spin bonus game! Excalibur Free Spin Bonus Feature Game – if you hit 3 or more Gold Chalice Scatter symbols that are scattered anywhere on the 5 reels, you will trigger the Free Spin Bonus Feature game, wherein you can win 10 Free Spins in which all your winning combinations during the 10 Free Spins are generously tripled! What’s more fun and exciting is that if you trigger yet again another 3 or more Gold Chalice Scatter symbols during the Free Spin Bonus Feature game, you are rewarded another 10 Free Spins! The extra Free Spins are added to the rest of your Free spins. You can actually win an infinite number of extra Free Spins while playing the Free Spin Bonus Feature game. When the Free Spin Bonus Feature game has ended, you are then returned to the main Excalibur video slot game and your Free Spin game wins are included to your total win. Excalibur has 5 reels where you may bet on 20 pay lines. The minimum bet is 0.01 and the maximum bet is 1.00 per line. You can wager from 1 up to 4 coins per pay line. It is clearly more fun and entertaining to play online video slot machine games when there’s an Autoplay function available. Excalibur can be played automatically by just clicking on the Autoplay function located on the lower leftmost part of the screen. You can start Autoplay by just selecting the numbered buttons (from as low as 10 and as high as up to 1000). You can even customize your Autoplay with their Advanced Settings menu. You can begin Autoplay and “Stop” whenever: you manage to hit a win, you won Free Spins, your single win exceeds a specified amount, or your cash increased/decreased a specified amount. Once you are fully contented on your Autoplay settings, simply click on the Start button and the video slot machine game will spin automatically for you.